It appeared the summer of 2017 would just flash by. As mentioned before, the park and therefore the campground was busy. However, our work schedule offered us many opportunities to explore and spend time with friends who visited us in the park and with friends and family outside the park. This chapter of our great adventure will primarily focus on personal guests and our travel outside Yellowstone as well as our autumn trip after a short stay at home. A Fast Summer Morphs Into a Faster Autumn and Winter. Early in July, we were honored to once again get together with another couple we had developed a strong relationship through our working careers. Chuck and Diane Haferman would make their second visit to Yellowstone. Being seasoned travelers, plus their familiarity with the area allowed them to do their own thing while we worked. Our schedule did afford us the opportunity to spend some time with them in the more relaxing setting of restaurants. Our relationship with Chuck and Diane dates to our time in Hawaii in the early 80s. While I was stationed on USS Hawkbill, SSN 666, Connie worked in the neonatal care intensive care nursery at Tripler Army Hospital where she met Chuck and Diane. We had kept track of them over the years. On one occasion while Chuck and Diane were working in Boston, we parked our motorhome in the driveway of their home in Upstate New York and enjoyed the comforts of a real living room, kitchen and most importantly a hot tub for several days while I was training for the Marine Corps Marathon. That adventure is well documented in a blog post from February 2011 titled The Lost Blog Post. Suffice it to say that our relationship with the Hafermans goes back a long way and is quite strong. As usual, our visit with them in Yellowstone was far too short but very much enjoyable. For those who have known me or have been following this blog, you will remember that I was born in Sheridan and still have relatives living there. A few years ago, my brother, John, moved his family to Sheridan from the suburbs of Denver. John and I are not dissimilar from many brother teams around the world. While we agree on many things, there are things we have agreed to disagree on and therefore avoid. Then there are those things we don’t agree on and we somehow relish rubbing one another over. That is the case where photography comes in. 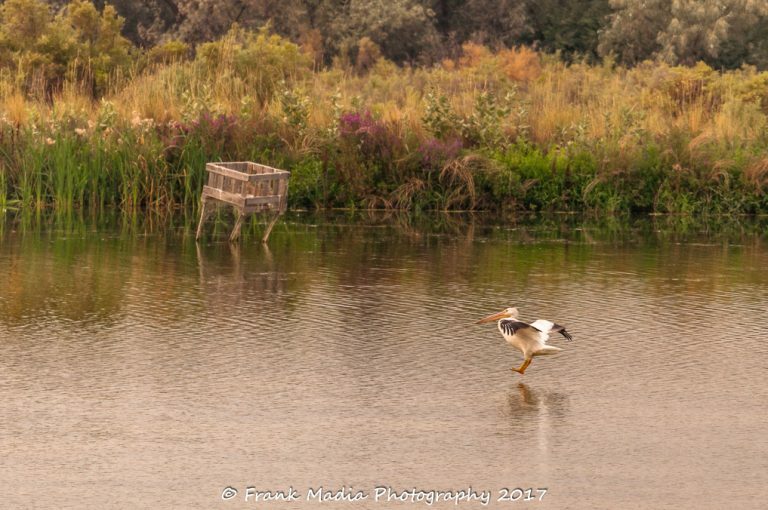 Somehow, we both have found ourselves as serious amateur photographers in the same niche of nature and wildlife photography. While I seem to have an affinity for bears, John is equally attracted to moose. Our most serious area of disagreement revolves around our choices of camera makers. John is a Canon guy and I am a Nikon guy. We each have our stated reasons for going the way we did. While John does a lot more research before making decisions that have long legs, I have a history of doing a little less research and more observation. The debate regarding which cameras built by which company are best will not be resolved here. Just suffice it to say that on those very rare occasions that John and I get to shoot together there is a good bit of smack talk that goes on. However, the real test would simply be to compare images after a day of shooting with one another. That seems to make a lot of sense, yet it has never happened. Connie and I had traded some days around with our friends Rick and Donna Dumar early in the season so they could spend time with their son and his young family. That trade offered us a long weekend in July as payback. We gave John and his family plenty of warning that we would be invading the area. 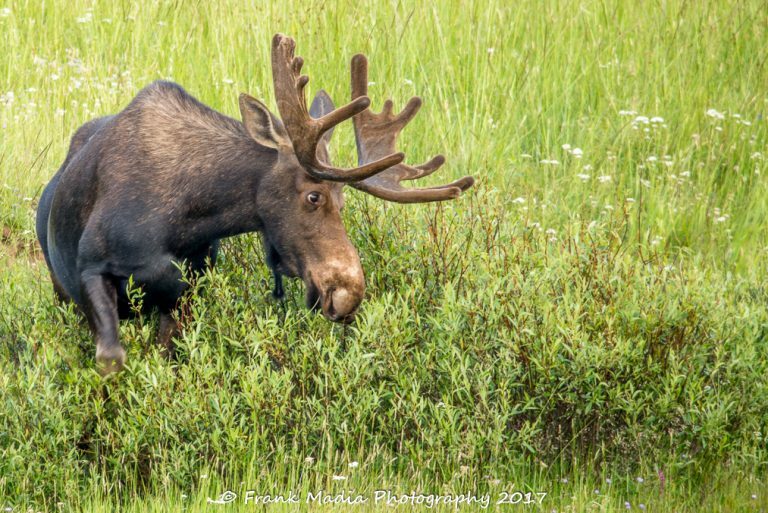 So, John put together three days of structured roaming in the Big Horn Mountains where we would have ample opportunity to make a bunch of photographs with the same subjects. There were several occasions where we found ourselves side by side shooting the same thing. I have never seen any of John’s photos from that trip and until he reads this, he has never seen mine. In fact, the only discussion we had on the topic post shoot was regarding the only common piece of equipment in our bags, the Sigma 150 – 600 mm telephoto lens. In my last post, I discussed some of the trials and tribulations I had encountered in my use of this lens. By the time we got together with John, I was well on my way to having at least a good knowledge of what I had been doing wrong. While I tried to not to think about the fact that John and I were probably about to determine who had the better camera body and possibly who was the better photographer, I would be lying to say it was not in the back of my mind. I made a bunch of photos during those days in the Big Horns. Many were throwaways, but there were some notable images that survived the delete button. John loves photographing Picas. I have never taken the time to seek these little critters out and spend any quality time with them. On our first day out, we had visited a place called Wagon Wheel which is a now protected sacred place where Native Americans go for spiritual purposes. The adjacent area has also been a great place to find Pica. The Pica live in rocky outcrops about a half mile from Wagon Wheel. I think any respectable photographer would find it hard to be any closer to Wagon Wheel while chasing Pica. We were able to find a few Pica, but for the most part, they were not within the range of even our 600 mm lenses. I have enlarged one image to provide evidence that I saw one. A greatly enlarged portion of the same image now with a recognizable Pica. 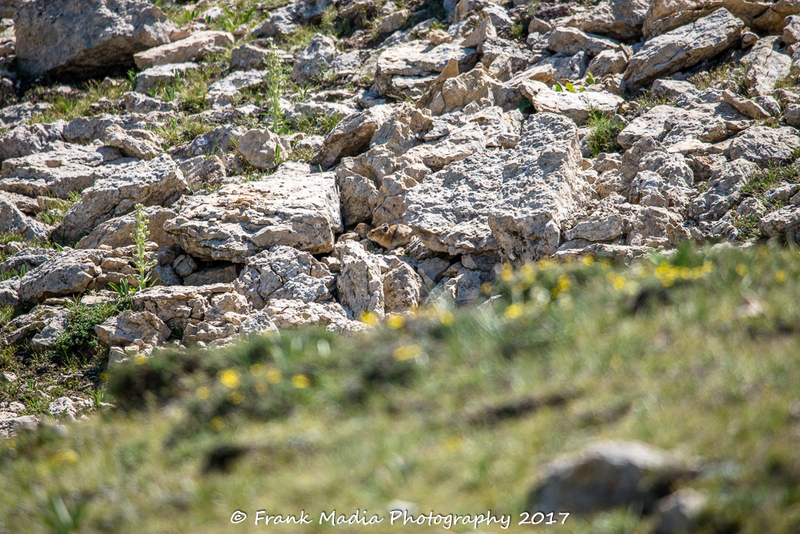 However, while we were on the search for Pica we saw several Yellow-bellied Marmots, a Chipmunk and at least one Deer buck watched us from well above our location. 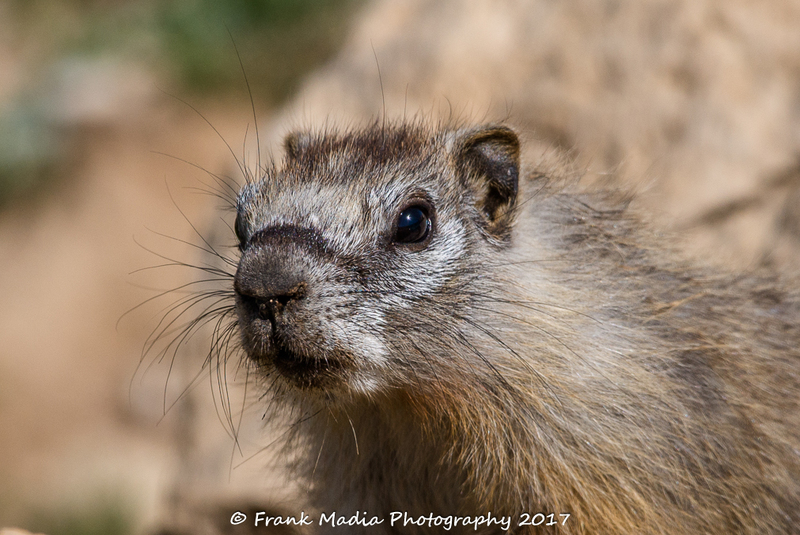 When the session was over I had a few nice closeup shots of a young Yellow-bellied Marmot. My deer images were not worth the pixels, while I did get a few cute shots of the Chipmunk. This young Yellow-bellied Marmot was hanging out near the entrance to its den. It kept coming out for a look around and was a perfect model for John and me. I was able to get in real tight with this shot. The little critter had no fear. Of course, I was standing about as still as I could so as not to frighten it. Later that day, we came across a bull moose. The lighting was challenging, but I managed to get a few good shots of him. By now, it was getting late in the day. I was having a little trouble getting in the proper position for great lighting. I also had trouble deciding which images to share here. Remember, John is the moose person. I just love trying to get the best pose from any of the creatures I photograph. He was oblivious to us as he chomped away on his dinner. This could be used for his head shot were he to decide to go into the film industry. Okay, last one. 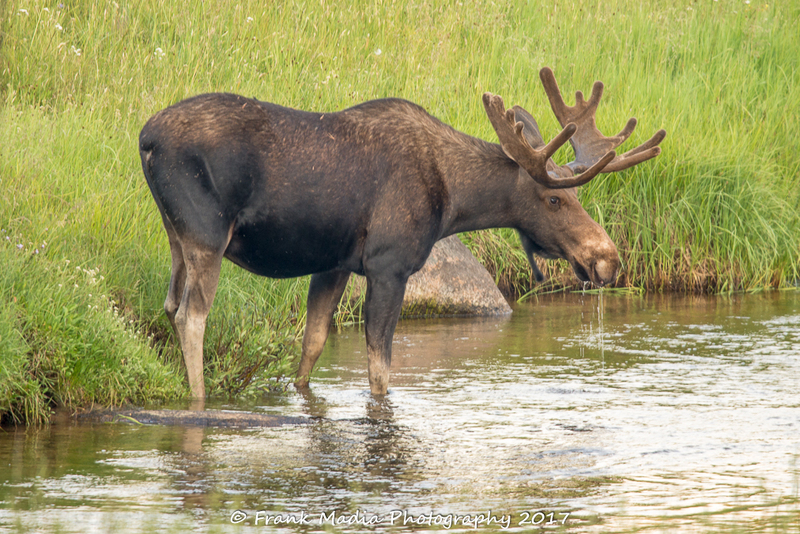 When I think moose, I think water. So, soon enough our guy got thirsty and headed for the stream. 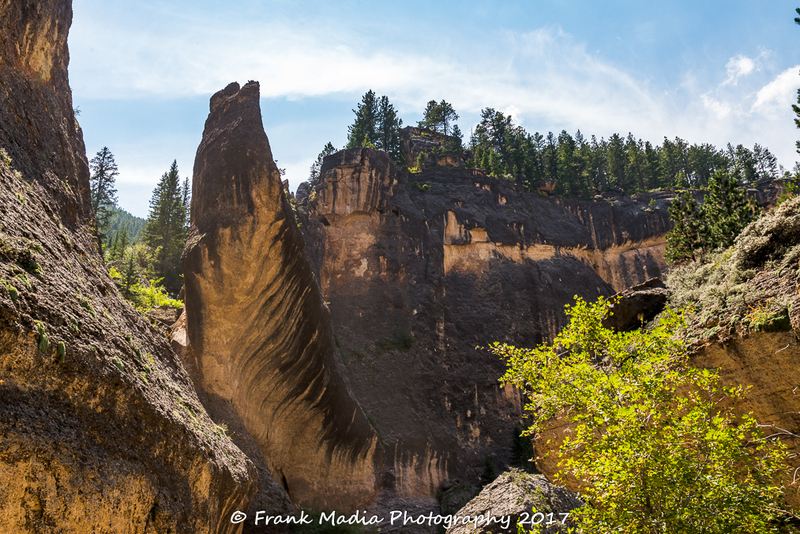 On our second day of wandering through the Big Horns, we drove up Crazy Woman Canyon. The rocks and the creek offered up some temptations that resulted in several short stops. Here are a few of the images. I found Crazy Woman Creek to be absolutely beautiful. I could have spent hours here just soaking in the textures of the water, rocks, trees, and grasses. It was truly a special place. This was the exposure and composition challenge of the day. There was bright sunlight on some faces while others were deep in shadow. I will admit to a little more computer work than usual to get you the image I saw real-time. Our last day in the mountains found us exploring an old splash dam ruins. In the late 1800s and early part of the twentieth century, logs harvested from the abundance of trees in the area were transported down the mountain via flumes. Splash dams were constructed in areas near where the logging was being done. 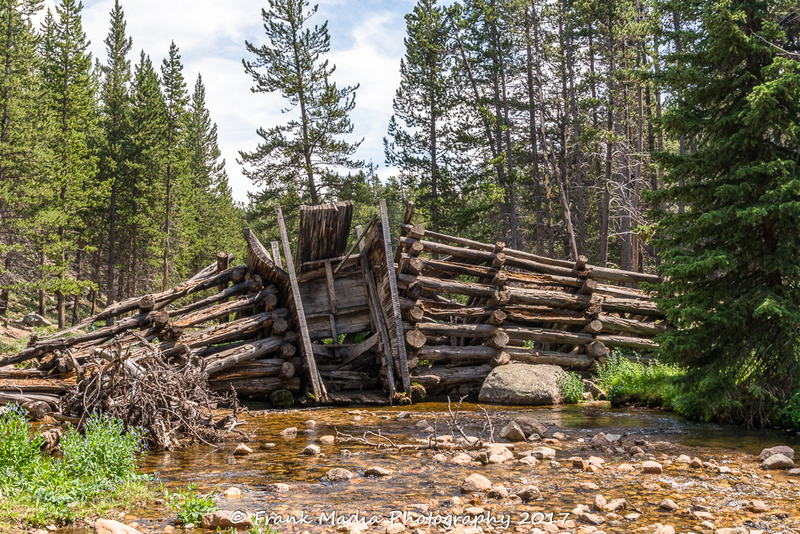 The logs were dragged to the splash dams where they were stored until conditions were right. Then the gates of the dam were opened, and the logs were flushed down to holding ponds at the head of the flumes. From there they were floated into raised V-shaped structures, flumes, that carried the logs with the help of water to processing plants at the foot of the mountain. Logs could get up to nearly 80 MPH as they moved down the mountain. While we found no surviving flumes, here is what remains of one of the splash dams. Not much more to say about this. I walked around the splash dam to try to get a better understanding of what the complete structure might have looked like. I was not able to sort it all out. More research required. Our visit to Sheridan and the Big Horn Mountains was both fun and exhausting. We had anticipated this, so we had booked a room in an Airbnb in Cody for a day of relative relaxation prior to returning to the park. This was our first experience with Airbnb and I have to say it was wonderful. We are now sold on the concept and as we plan our non-motorhome trips we research Airbnb as well as the traditional hotels and military lodging facilities along our various routes and destinations. Our afternoon in Cody was spent finishing our tour of the Buffalo Bill Historical Center from a previous stop and of course a visit to Sierra Trading Post where good deals can be found on outdoor clothing and gear. After another work rotation, Connie and I were on the road again, only this time within the park boundaries. We love going out to the Lamar Valley several times a season because it is always changing. On this day, we were on our way back towards Mammoth when we found ourselves in an honest to goodness traffic jam. It took a few minutes to determine which species of animal had caused the stoppage. As we crept ever so slowly to the southwest we were finally able to see a bull bison who appeared to be injured as he had a noticeable limp and he was not doing a lot of walking. This bison was a massive animal. Not far behind the bison was an equally massive albeit very old grizzly bear. 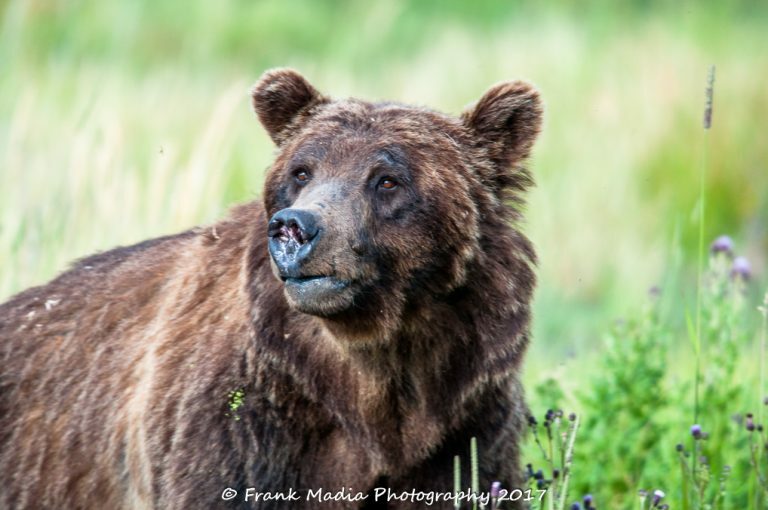 As we watched, it appeared the bear was sizing up the bison trying to decide if his injuries were severe enough to make him vulnerable to attack. I emphasize appeared because I am not an expert, just a somewhat seasoned observer. The bear made some slow approaches toward the bison and watched as the bison limped away keeping some sort of perceived safe distance between itself and the bear. Eventually, the bear lost interest in the bison and tried to make its way across the road towards the river. The traffic was mostly stopped and bumper to bumper in both directions. This fact made it impossible for the bear to cross, so it started walking to the east along the road looking for a break in the vehicles. That was a wonderful decision as far as I was concerned as he had to walk past our car. By now, I had my camera and long lens at the ready. Both passenger side windows were open, and I was braced in the seat to make the camera and lens as steady as possible. Then the bear moved into a position where I had a clear shot. One burst of shutter releases after another was made. I had to back off on the focal length at one point because the bear was so close I couldn’t even get its entire head in the frame. You talk about an adrenaline rush. I was over the top with excitement. This was by far the closest I have ever been to a grizzly bear with a camera and it was all legal because I was inside the car and in full control of the windows. Only a few images survived my editing process, but I think you might like this sample. This bear is an old-timer for sure. It has many battle scars but otherwise seemed to be in great condition. There were other images that survived the delete button, but I think this one would be the one the bear’s mother would like hanging in the den. During a normal off-duty rotation early in August, we made a planned trip to Boise, Idaho. Our goal was to visit another friend from our Navy days, Barbara Wilson. Barbara had just relocated to Boise from Northern Virginia following her retirement from teaching. Our timing was perfect, as her household goods had arrived just far enough ahead of us that she had gotten her brand new home put together and knew where most everything was. We had also been wanting to visit with one of our birding friends we had not seen since 2001, Denise Hughes. While Barbara and Denise do not share recreational activities, we were able to get all four of us together for dinner our first night in town. We had a great time catching up while the two women got to know one another a bit. Connie and I split the rest of the weekend between these women. 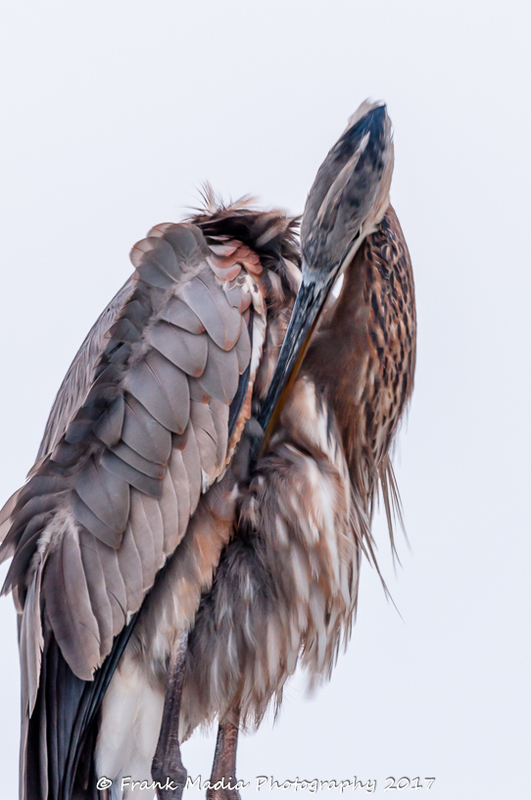 On our second day in town, a Saturday, we went on a day-long birding trip with Denise. Denise is an excellent birder and, of course, very familiar with the local hot spots. 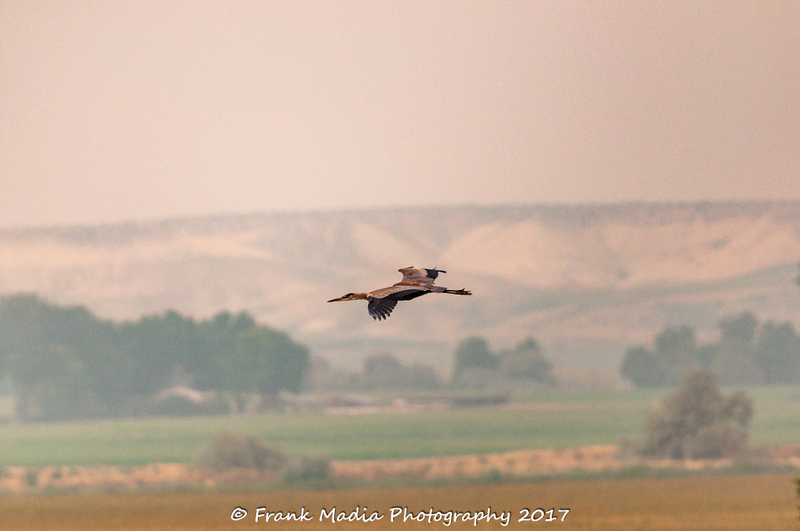 While some birds were in good abundance, we were hampered by a great deal of smoke from wildfires burning to the west and north of the area. I was still getting used to my new long lens and the smoke was not helping. 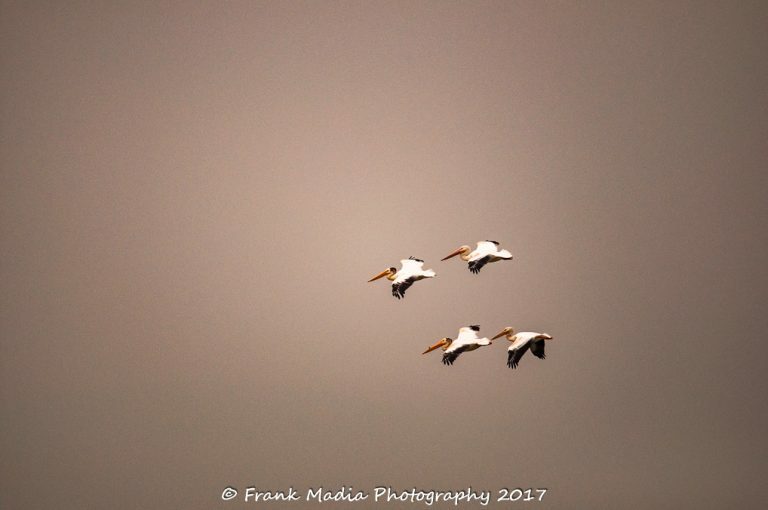 Since returning home to Texas, I have learned a few more things about Lightroom and have taken a second look at some of the Idaho birding photographs. Here are a few of the keepers. 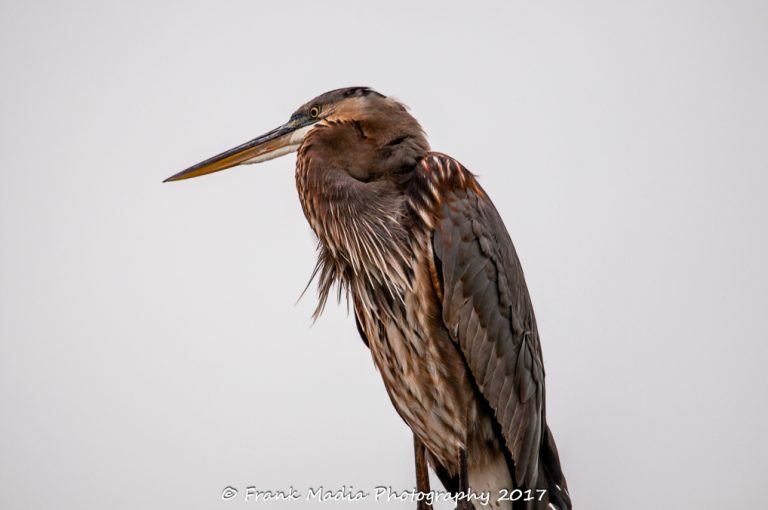 Photographer’s note: The bird images here are heavily edited to bring out the natural colors which were severely muted by the smoke in the air. 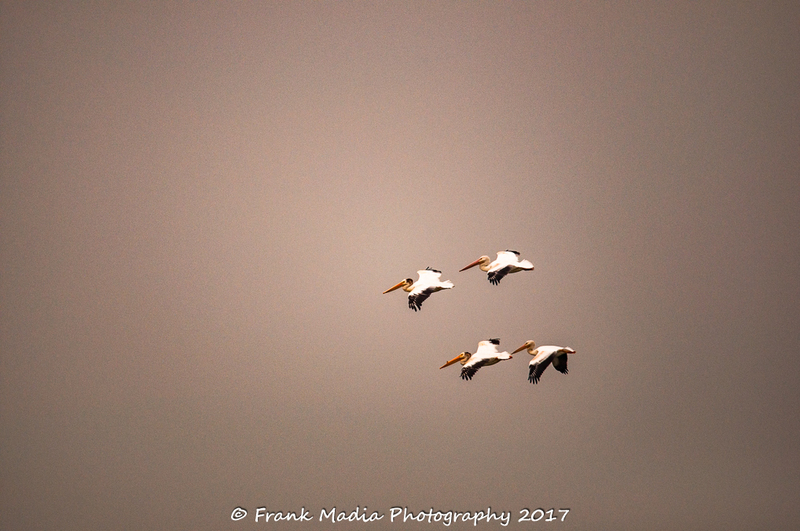 Pelicans flying in formation always get my photographic interest because they are large, fly relatively slow, are somewhat synchronized and are often seen at low elevation. They are also fun to watch landing on water. This scene was just too pretty to pass up, even with the smoke. 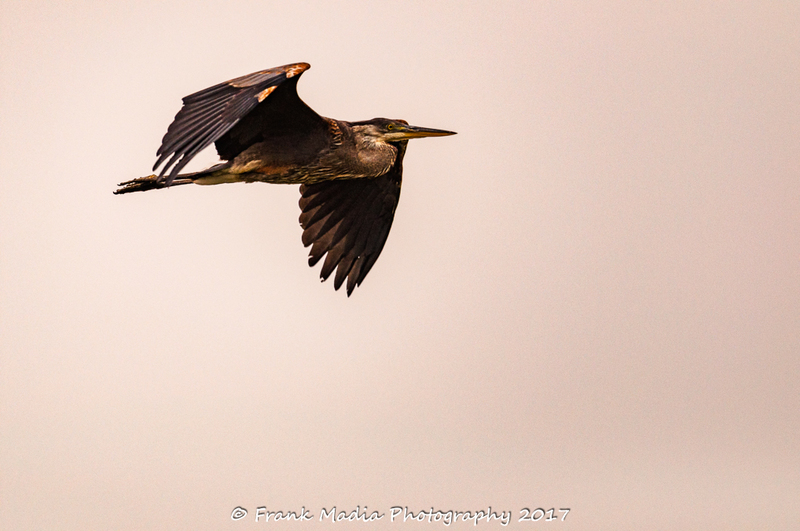 It is also hard to pass on a Great Blue Heron flying overhead and close. 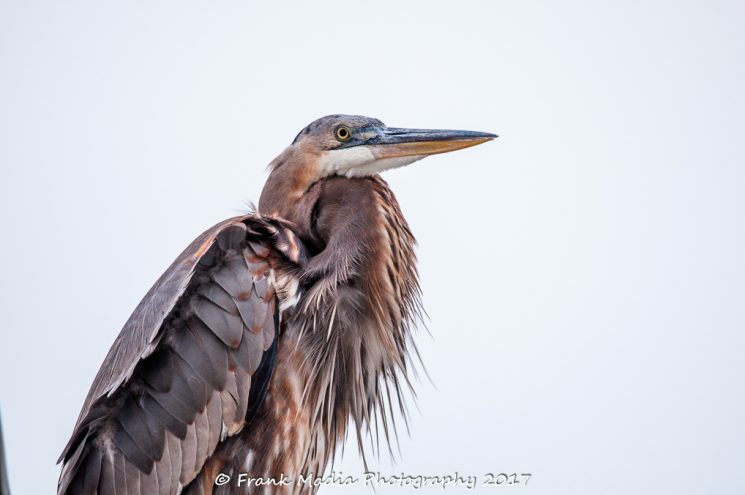 I was able to stay on the Great Blue for a good while. When the smokey conditions get you down, you have to turn your attention to closer critters. 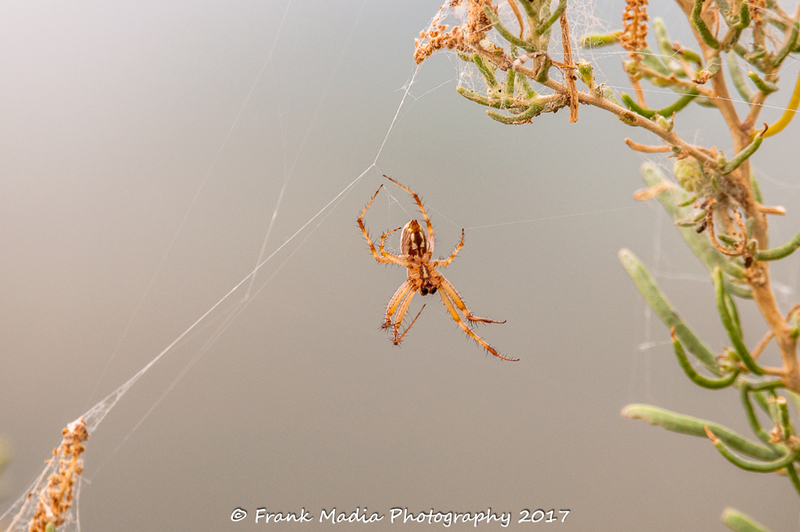 The smoke provided a neutral background enhancing the view of this spider. 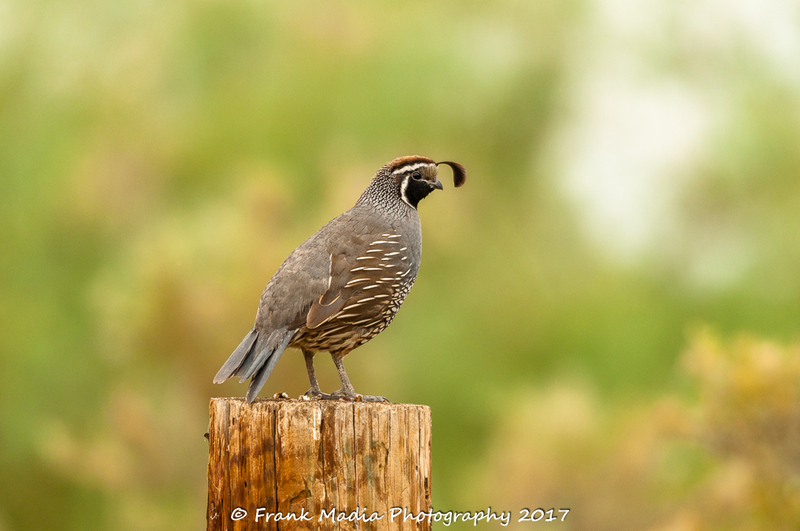 Finally, a clear view of a California Quail. 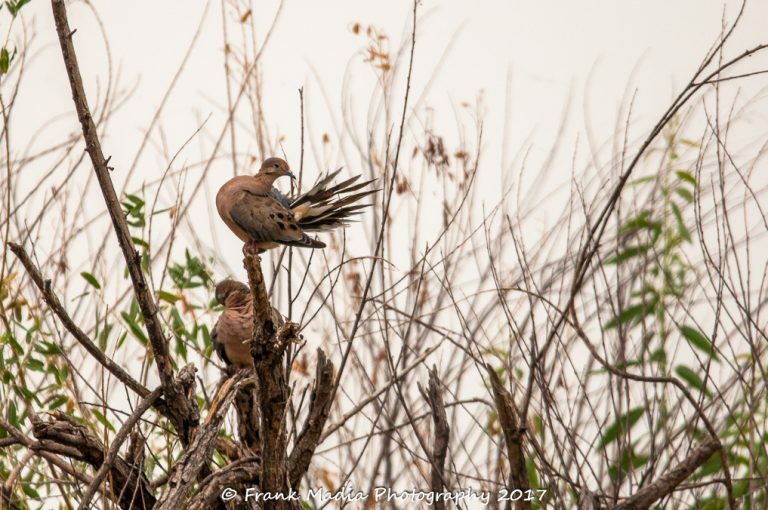 A pair of doves preening. 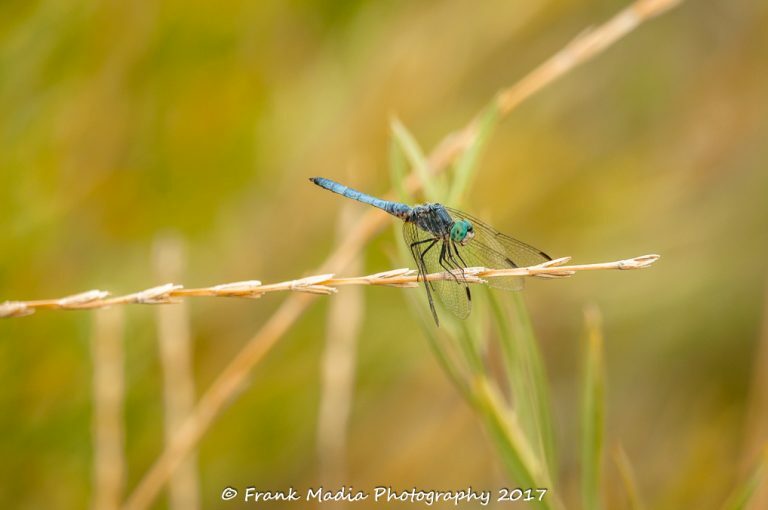 Another opportunity to capture the details of a Dragonfly. We ended that day with a wonderful dinner with Barbara and one of her sons and his family. Once the junior generations left for the evening, we continued our visit over wine and beer. It was a great way to end the day. Our third day was a shopping day for Barbara and Connie with Frank tagging along for style points. Of course, between stores and over lunch and dinner we continued to enjoy catching up with all that Barbara had been through since we last saw her. When we were last together, I was in the final training stages for the Marine Corps Marathon and Barbara was recovering from a fall that resulted in a significant surgery to repair her arm. That meeting was not too joyous. Our visit to Boise was certainly much more pleasurable. On the drive back to the park we passed through Arco, Idaho where I had lived while training at the Navy’s nuclear propulsion training facility located between Arco and Idaho Falls. As the miles and miles rolled by, I began telling stories about my early days in the Navy, which led to other stories that Connie could relate to. Somehow, during this long period of reminiscing, Connie got to working her phone and was able to locate the executive officer from my last submarine prior to my commissioning and ultimate move away from submarine operations to submarine maintenance. More about the former executive officer later. The next big event of the year was the total solar eclipse on August 21. We were working that day, but the expectation was that we would not be busy because Yellowstone was outside the path of totality. However, we also could not leave to get into the path. 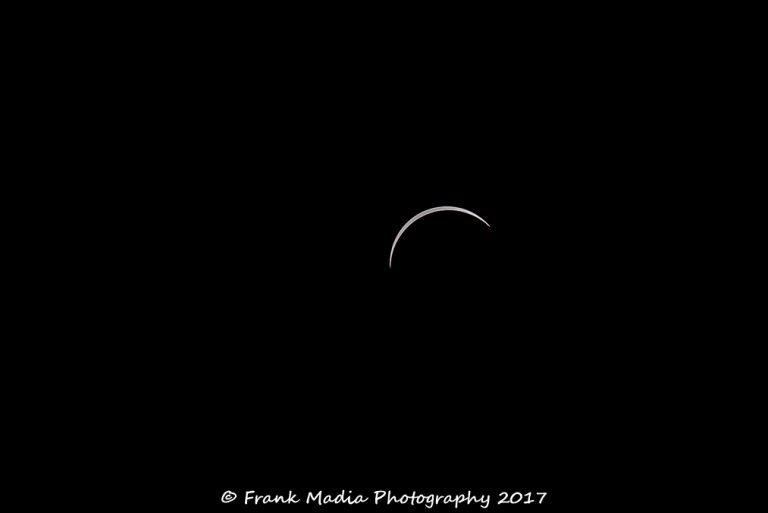 I had plenty of time to set up my gear and make a bunch of photos as the eclipse started and all the way through to the closest point to totality we would see and then part of the backside. I kept myself entertained between making photos by watching the event live on television through the open door to the motorhome. In preparation for the eclipse, I visited my favorite camera store, Bozeman Camera and Repair and purchased a special filter that would protect my eyes and as importantly the sensor of my camera from the direct looks at the sun. The good folks at Bozeman Camera had stocked a good number of these filters that would fit super telephoto lenses. They taught me how to install the filter on the end of the lens and emphasized the safety aspect of making direct photos of the sun. It is a little tricky making the transition from looking through eclipse glasses to looking through the camera viewfinder without the eclipse glasses. All without sneaking a naked eye peek at the sun. Several days before the eclipse the owner of the store called to caution me that the filter they had sold me had not been approved by NASA and therefore they could not guarantee the safety of my sensor. He went on to say that he and others in the store had been practicing with one of the filters and they had determined that it was providing at least ten stops of filtration and therefore it should be okay. He emphasized that point was their opinion, not a scientific fact. I was offered a full, no questions asked, refund, which I refused since I had also been doing some practice and I had trouble finding the sun through the filter. I was convinced if the light getting through was that filtered I could not be doing too much damage to the camera. That was the correct decision because I had fun and my camera is fine. While my images are nowhere near as dramatic as those captured in the path of totality, I am proud of the quality of the images I made. It is nearly impossible to focus on the sun with the filter installed. It is like trying to focus on stars. There is insufficient light available for autofocus to find the sweet spot. Manual focusing is challenging because with the extremely filtered light it is difficult to see a sharp focus. I saved you from the long string of images I made and have shared that image that represents the point in time when the eclipse was as close to total as it got where we were positioned. By the way, the next total eclipse will pass within several miles of our home in Texas. We will find a place to claim for a total eclipse photo session. The solar eclipse also brought our fourth personal visitor to the area. Bob Miller a birder and guide, a friend, and a great guy traveled from Brawley, California with his nephew and his family to get into position to view the eclipse from within the band of totality. Being so close to Yellowstone they also planned a trip to the park after the eclipse. The group camped with us at Indian Creek Campground where we got to spend hours talking to Bob. Bob had suffered a significant accident several months before and was still in the recovery mode when he visited us. Out of respect for his privacy, I will not share the details of the accident. I will say he is one lucky guy to still be with us. The fact that he is one tough individual and as experienced as he is in backcountry survival certainly contributed to the fact that he not only survived the accident but is truly recovering. Of course, I did give him a little trash talk for not acting his age. The rest of our season was more sublime. 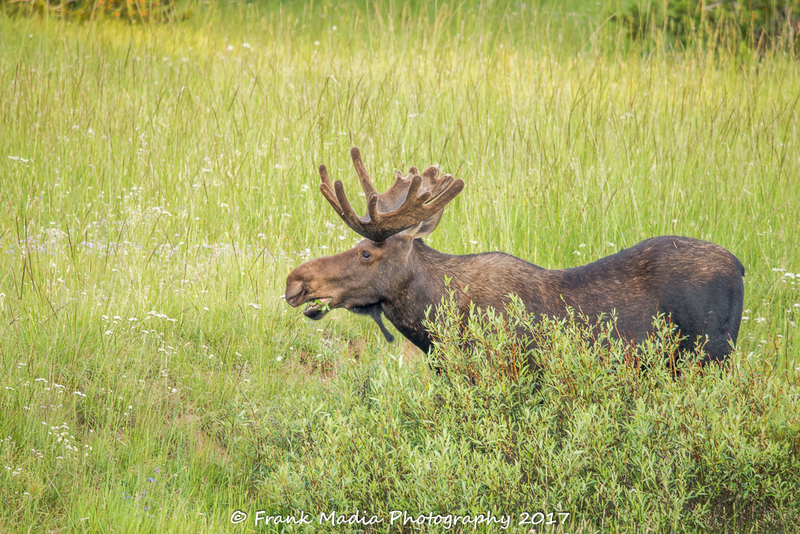 While we continued to travel around the park and the surrounding area all the way to our eventual departure for the season, we didn’t encounter much in the way of out of the ordinary. Our last visitors of the year would be our long-time friends from Bremerton, Washington, Janet and Joe Drouin. I have known this couple as long as I have known Connie. They were friends of Connie’s when I met her. Over the years we have seen far too little of one another. However, this was their second fall visit to Yellowstone during our time there. It is always great getting together with the Drouins. Conversations started 36 years ago continue whenever we see one another. On this visit, Joe honored us with an etched glass pane that had been a booth separator at a place called Chugwater in Bremerton. Chugwater, was a Country Western club with live bands every weekend. While Connie and I did not meet there, we certainly spent a lot of Friday and Saturday nights there in that first year we knew one another. Chugwater is no longer. While the current owners were preparing to remodel the interior of the building, Joe made it known he would like to have some of the glass panels. He had been saving the one he gave us for several years. We were so pleased to receive it. Now, I just need to build a frame for it. We know where it will hang in our home. Sorry, no photos to show. Don’t worry, I am not going to bore you with a long-winded description of our drive home. Suffice it to say we only had two must-stops along the way. First was in Sheridan, Wyoming for a last dinner of the season with my brother John and his family. Next, we would stop in Greeley, Colorado for a quick visit and wonderful homecooked dinner with my sister Mary Ann and her family and manfriend Kelvin. Both of these visits helped us to close out the season on positive notes, not that the whole season had not been positive. It certainly was. We got home on November 1. We left again on November 6. We barely had time to get the motorhome unpacked and into storage before we were packing for what would be a nearly month-long car trip to Florida and Pennsylvania. The trip to Florida was to attend the wedding of one of our grand-nieces, Annie Kushner to Calin Noonan. We had visited this wonderful young couple during our Florida trip last February and were looking forward to the wedding. The wedding and all the associated activities made for a wonderful weekend in the St. Petersburg area. We were delighted to be included in this beautiful beginning to what promises to be a long and wonderful journey for this super couple. We wish them all the best in their future together. We stayed in an Airbnb close to the wedding venue. 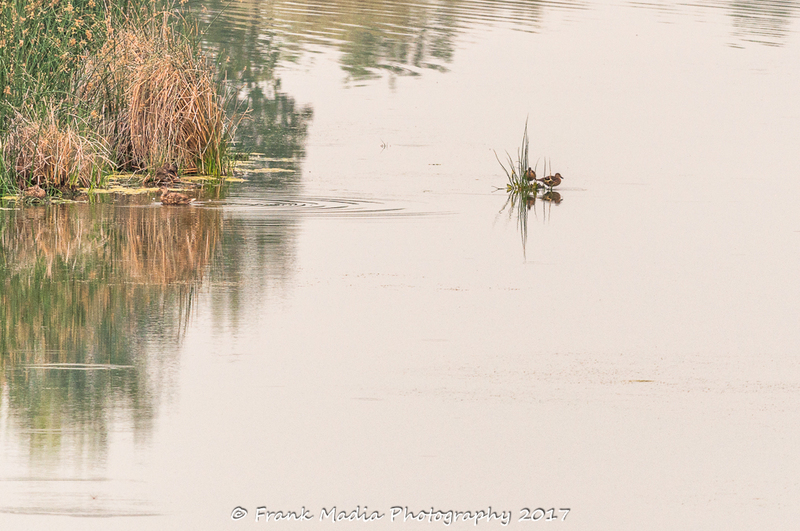 While I did not make any photographs at the wedding, I did find a few birds that begged to be photographed during our stay. Here is a sample. I went on a late afternoon run. Just a block or so from our rental, I spotted this Great Blue Heron perched on the support cables of a street light. The sky was cloudy, giving me that neutral gray background. However, the light was also low making it difficult to tease out the colors. I kept trying. The light didn’t get much better, but the bird became a little more active. 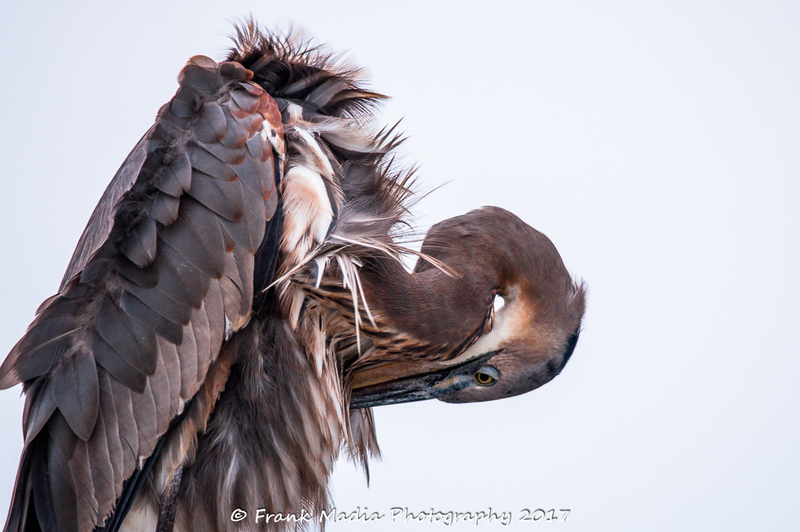 The need to preen seemed to be what caused the bird to turn around. My need for more images kept me glued to the viewfinder waiting for the next shot. Even though I had the lens supported by the tripod, the shooting was a challenge because of the angle at which I had to be to get the bird full frame. 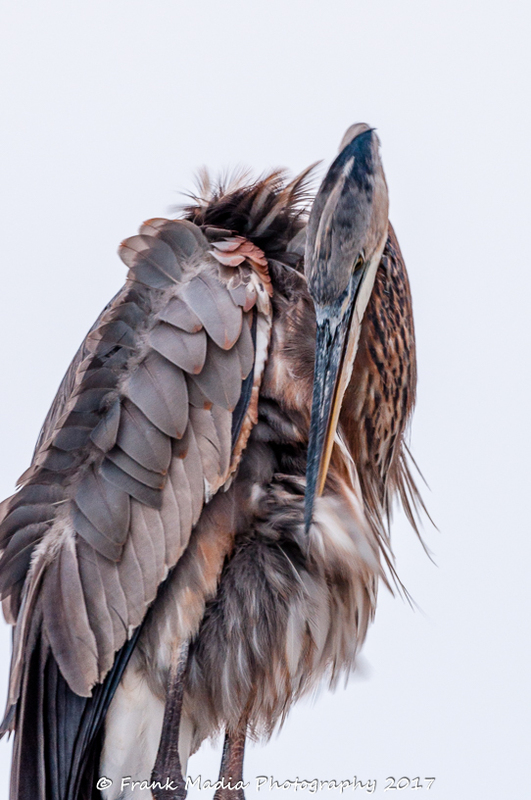 I particularly liked this image because of the motion of the features at the end of the beak. 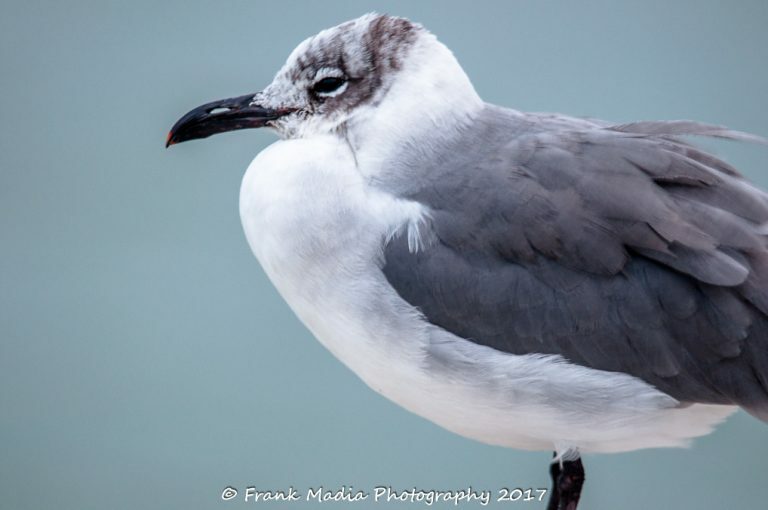 As I walked back to the house, this Laughing Gull begged me to make a photo. The problem is, I don’t t know where to send the print. The day following the wedding, we were back on the road headed indirectly to Pittsburgh, Pennsylvania, for our annual visit with Connie’s sister, Barbara Slager. Our first stop would be in Lakeland, Florida for an afternoon visit with that former executive officer I referred to earlier. As I have not gotten his permission to share information I will just say that his first name is Tim. Following Tim’s navy career, he worked another career and retired a second time. He then found himself working with or for his daughter in real estate. Tim and his wife had settled in Lakeland, but Tim spent a good deal of time in Connecticut where his daughter’s business is located. While on an extended stay in Connecticut he suffered a massive stroke that left one side of his body nearly useless. His wife of just a few years became his primary care provider making sure he made all his rehab and physical therapy appointments as well as most of the constant care a chair bound person requires. She is doing a magnificent job and Tim knows it. Visiting with them reminds us of the definition of true love and commitment. Our visit with Tim was emotionally painful for us because our memory of him was that of a vibrant energetic man who was always on the go. The visit also left us full of hope and confidence that he will recover to a point of at least partial self-sufficiency. Even though his body is not what he would like it to be, his mind is every bit as sharp and full of wit and determination as it ever was. The dedication on display by his wife is so promising. As we talked, hope and determination dominated the discussion. Connie and I wish them both the absolute very best. Not wanting to burden Tim and his wife too long and the suspicion that there are many daily chores that must happen on some sort of schedule to help him rebuild his body we kept our visit short. It also became a little obvious as our time with them rolled on that he was becoming physically uncomfortable in his chair. So, filled with hope and more than a little sadness we made our departure, so he could rest. From there we were off to Jacksonville Beach to see our good friends Pat and Marie McGahan, the couple we spent most of last February with during our trip to south Florida and the Keys. As it turned out the McGahans returned from a delayed honeymoon in Hawaii the day before we showed up. Knowing that was to be the case, we insisted they do nothing to entertain us. Instead, we would go out to dinner and meet up with our other long-time friend, Trish McMillan. Our stay was just for the one night and then we were on a path to the north. We did stop in St. Marys, Georgia, to have coffee and spend a little more time with Trish. From there on the Pittsburgh was a Madia style sprint. Once we got to Pittsburgh we were able to slow down a little. Our primary purpose for being there was to visit Barbara, as we would not be going back for Thanksgiving as has been our habit. Of course, there are many other people we love spending time with while in Pittsburgh. This group was at the wedding we had just attended, but it was easier and more fun to get together in smaller groups and enjoy one another’s company a few days removed from the ceremony. After a four-night stay in Pittsburgh, it was time to start the long trek homeward. There would be one meaningful stop on our way home. That was Indianapolis, where were able to connect with Simon and Cindy Martin. Simon was a shining star among a small galaxy of excellent young officers who I had the pleasure of supervising during my tour as a production manager on a submarine repair ship stationed in La Maddalena, Italy. He was an excellent leader and well respected by his subordinates. I was frequently entertained at our morning production meetings by Simon’s input. As has been the case with far too many of our former Navy friends it had been far too long since we had seen one another. Dinner at a wonderful brewery located in a former Catholic church was the perfect setting to reconnect face to face with this super couple. From there we were on a beeline to get home before Thanksgiving and the start of Frank’s weight reduction program. We made it on both counts. With this, I am officially caught up! As I complete this post with the editing and insertion of the photos, etc., we will be leaving again for a winter trip to Yellowstone. The reason for the trip is photography and photography. Did I mention photography? I had a goal to get my blog caught up before we set out on what we hope is an adventure of a lifetime that should likely result in many photographs and even more memories. So, stay tuned, because there will be more. OMG, Frank, this is your best yet! Love, love, love the wildlife photos, you obviously made a good move purchasing that new lens.